Animal shelters across the nation are filled with countless thousands of cats and dogs needing forever homes. If animal lovers had their ways, these homeless creatures would fill their homes and shelters would be empty. Unfortunately, many of us are already filled to capacity, and some can’t have animals at all where they’re at. But we still want to help these animals in need. If you can’t adopt from your local shelter, there are still many ways you can help this cause. Of course there’s the usual method – donating. But sometimes our pocket books can’t keep up with what we’d like to give. Don’t be dismayed – there’s still a slew of different ways to adopt a shelter and help the animals. Most shelters are understaffed and underfunded. They don’t have enough hands to go around. Adopting a local shelter by donating your time is a much appreciated gift. Donate by giving your time at the shelter: cleaning, walking animals, petting cats, putting up flyers, helping at events. Donate by sharing your expertise: Help with a web page, write articles or grants, help with office work, photography, accounting or legal services. Check with your local shelter to see what items are on their wish list. Many appreciate donations of new or gently used bedding (beds, blankets, and towels), crates, or toys. Food, litter and cleaning supplies are always appreciated. Mother Nature Network has an excellent article with 25 ways to help your local shelter. They mention scanning Craig’s List or Freecycle for items that would be useful at your adopted shelter. Low Country Dog magazine has a link to Twitter a Critter, a web application that helps spread the word about pets that need adopted. Get crafty and create some useful items for your local shelter. BarkPost has a post with 12 creative ways to help animal shelters. They include instructions on how to make a pet bed from an old sweater. The Humane Society has a post with 10 ways to help your local animal shelter or rescue. They mention several ways to get crafty, with links for different toys to make, braiding strips of fleece and making DIY cat toys from empty toilet paper rolls. 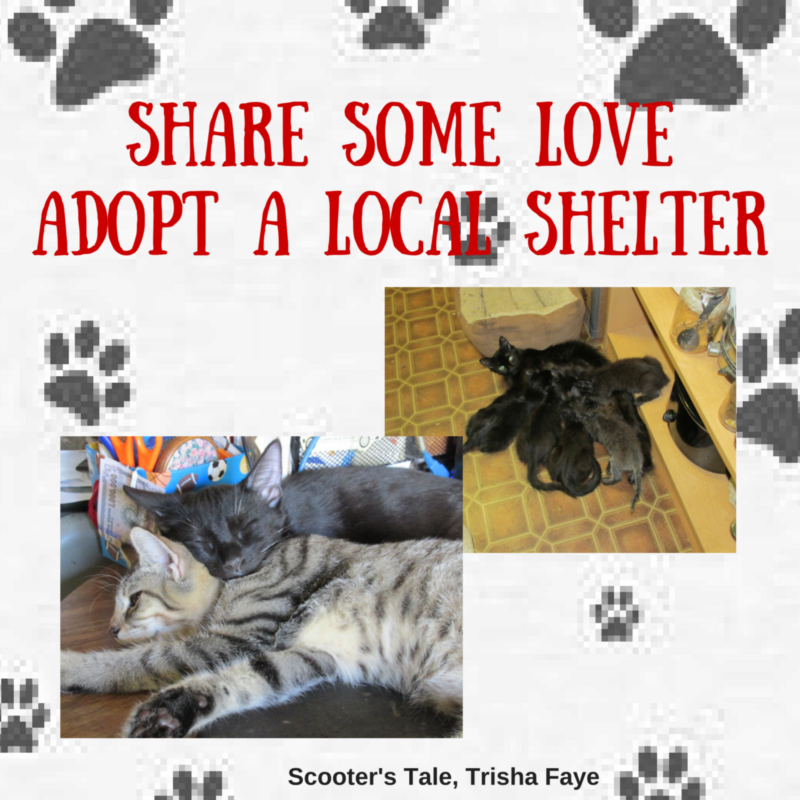 Have you adopted a local animal shelter or rescue? What ways do you help out? Abandoned kittens continue finding their way to Trisha’s north Texas home. After Scooter and his two sisters were saved from a feral life, she thought that was the last of the new arrivals. (They share their story in Scooter’s Tale.) But…after that came Jasper, and then Onyx. This past April little Piper joined the family after feral Mama moved her kittens before a big storm, but didn’t come back for Piper. A month later Onyx’s sister, CeeCee, walked in the house (very pregnant) and hasn’t left, even after giving birth to six coal black kittens – who now rule the household and think they’re related to gray tabby Piper.